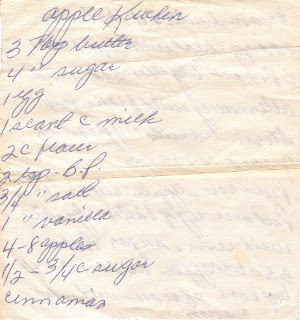 In honor of apple season, I thought I would share one of the many apple recipes in the box. Kuchen, as I learned this week, is the German word for cake. I also learned that there are many variations of this German dessert, a tidbit I encountered while researching an error I discovered in the directions written on this card. If you notice on the top line of the instructions on the second side of the card, the first step is to cream butter with butter. As I stated before, I will never be mistaken for a chef, but this just didn’t seem right. So I did a search for Apple Kuchen recipes to see if I could find a similar one to confirm my suspicion that the second butter was really supposed to be sugar. At this point, I gave up on my search and trusted my instincts with the directions for the recipe. 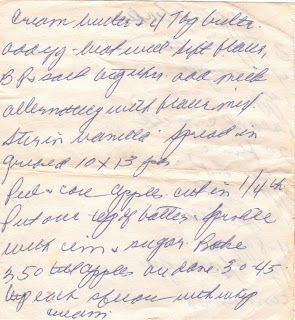 And I must note, I did notice that the recipe instructs you to sift the 2 cups of flour, etc. I didn’t think my cheese grater trick would work for that much flour so I invested in a real flour sifter. The batter turned out to be a semi-thick, fluffy mixture that tasted like pancake batter and made me curious to sample the final product. The next step was to peel and slice the apples, which an apple corer turned out to be a huge help in accomplishing. I assembled the dessert, added the final touches and placed it in the oven to bake. It didn’t take long for my entire kitchen to smell like cinnamon apples. As I was cleaning the dishes, something I feel like I’ve done a lot of lately, I came to my new sifter and smiled as I dunked it into the warm, soapy water. I owned a sifter. No recipe that has the direction “just add water” requires a sifter. I was proud of my accomplishment (and recent purchase) and reflected on the difference between making a dessert out of a box and one that requires a dozen more steps and ingredients. There is something cathartic about baking from scratch. It requires time, concentration and you put a little piece of yourself into what you are making. I think I understand now why they call it “comfort cooking” That night, after a dinner I can’t remember, my husband and I sat down to a dessert I’ll never forget. Oh, and if you’re wondering, it doesn’t taste anything like pancakes. It has a moist cake bottom and soft cinnamon apples on top. The recipe suggests serving it with whip cream and that was a good idea. It’s like an apple pie, but not as strong of a flavor. It’s a great dessert to serve after Thanksgiving dinner. And I believe my instincts were correct, the first step is to cream the butter with sugar, not more butter. I have always tried to make from scratch, I enjoy the flavors better. So glad you bought a sifter, how fun! This reminds me of the English Apple coffee cake I made from my mom's file box. The ingredients are a little different but the pictures look about the same. You did a great job!! !